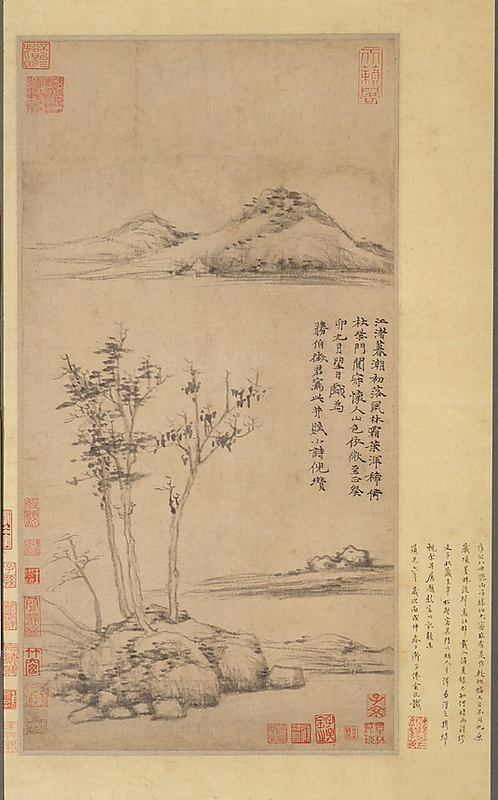 This landscape painting from 1363 shows the distinct style of Ni Tsan. Ni, also known as Ni Zan, often painted bamboo trees on isolated rocks appearing as islands among vase expanses of empty space depicting bodies of water. This painting was made for a fellow artist and scholar. The isolation that Ni was feeling after the death of his wife may have been reflected in this work by the isolated nature of his trademark bamboo trees. The frost-covered leaves of the windblown grove are sparse. I think of my friend—the glow is nearly gone from the hills. This is only the second mention I have found of Ni’s wife and I know from another work that the couple had at least one daughter. Most of what is known about this artist comes from the inscriptions on his surviving works. To learn more about this artist and see more examples of his work, please visit our Ni Zan biography.